Quantity Discounts available for giving to customers and colleagues! Raspberries and blackberries are a perennial favorite among consumers. Unfortunately, they are also a favorite host crop for pests. Protect your plants with the most up-to-date and comprehensive resource available: the Compendium of Raspberry and Blackberry Diseases and Pests, Second Edition. This completely revised edition helps users quickly identify and manage raspberry and blackberry diseases, insect pests, and abiotic orders with practical management information and more than 200 high-quality images for diagnosis. It is your best defense against pests and disorders that threaten the health and yields of these two popular bramble plants, from the roots and crown to their flowers, fruits, and leaves. Each section includes information on symptoms, causal organisms, distribution, diagnostic features or detection methods, and management strategies. 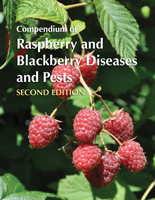 The Compendium of Raspberry and Blackberry Diseases and Pests, Second Edition is ideal for commercial growing operations, nurseries, crop consultants, extension educators, diagnosticians, plant pathologists, entomologists, horticulturists, regulators, and gardeners.